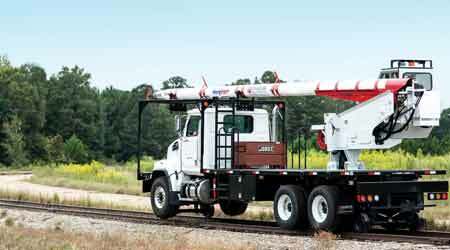 Progress Rail’s 75G2-HR (Hi-Rail) SkyTrim is a rough-terrain, rubber-tired vehicle with a telescoping boom and saw-type cutter head designed to trim trees on nearly any terrain. Keeping vegetation growth in check is a primary maintenance-of-way goal for railroads and transit authorities. In addition to ensuring tracks remain clear of weeds and brush, effective vegetation management programs enable maintenance crews to work safely and avoid slips, trips and falls. Cutting vegetation — particularly during dry months — also reduces the risk of fire along rights of way caused by sparks from locomotive exhaust, hot wheels or dragging brakes on rail cars, as officials at weed management solutions provider Brandt Road Rail note. To help railroads and transit authorities stay ahead of the weed and brush curve, suppliers of vegetation management equipment continue to enhance their product and service offerings. “We are taking steps to develop vegetation management and MOW equipment that helps our customers have the ability to utilize their assets year-round,” said Dean Mackey, general sales manager of utility and specialized products for Progress Rail, citing the company’s new Kershaw Ballast Regulator, which is built to cut brush in summer with an option for diverting snow in winter. Other suppliers anticipate equipment demand to remain high this year. “We’re expecting 2018 to be another good year,” said Bill Schafer, product development supervisor for Loftness Specialized Equipment Inc.
Not that all of that demand will lead to new equipment purchases. “We recognize the budget constraints in the industry for 2018 and are responding by offering factory-refurbished machines to help serve the challenging needs of the economy,” said George Pugh, chief operating officer of Knox Kershaw Inc., whose equipment was used during clean-up operations after Hurricane Irma struck in Florida last year. What’s new on the vegetation management equipment front? Progressive Railroading recently asked a sampling of contractors and suppliers to share information on their latest equipment and service offerings. Emailed responses from eight companies follow. All Railroad Services Corp. (ARS) is a full-service contractor that works with Class Is, short lines, regionals and transit authorities on vegetation management and right-of-way programs, including pole line removals, culvert cleaning, yard cleaning, overhead catenary removal, and tie pickup and removal. All Railroad Services Corp. offers full-service vegetation management programs designed by the company’s staff herbicide managers. The catastrophic storms that rampaged through several areas of the south-central and eastern United States last year created an increased need for clearance of vegetation debris. “While 2017 had a lot of emergency work due to the hurricanes and storms, we feel that there will be more work or projects in 2018 to complete without any more storms playing into the outlook,” said ARS President Mike Heridia. 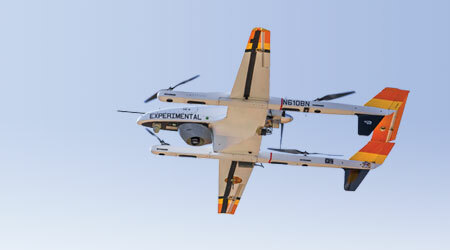 The company recently purchased a piece of equipment called the Heartland Chopper, which is equipped with a boom, as well as grabber and chainsaw attachments on the end. The operator is stationed on the ground and can operate the machine remotely, rather than in the bucket of the boom, thus minimizing safety risk, according to ARS. Asplundh offers a range of vegetation management services — from herbicide applications to trimming and mowing — to help railroads maximize safe operations and minimize track time. 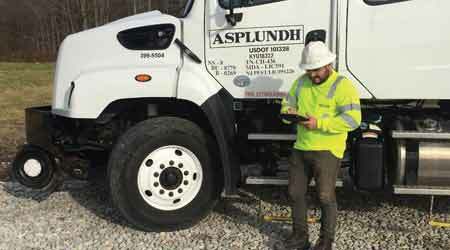 This year, Asplundh plans to introduce customer dashboards that include daily, real-time data on spray operations and vehicle tracking using GPS mapping — all packaged into a web-based customer portal. In 2018, the company plans to introduce new customer dashboards that include daily, real-time data on spray operations and vehicle tracking using GPS mapping — all packaged into a web-based customer portal. The dashboards provide immediate access to progress updates and details of vegetation-management programs being conducted. Data points include planned vs. actual schedule progress, as well as skipped track locations (and explanations for the skips), easy-to-understand charts and graphs of acres sprayed, and access to previous spray reports for comparison and trending purposes, the company said. Brandt Road Rail offers weed management solutions, including the Brandt Rail Tool, a hi-rail John Deere 225 excavator. It features a 52-inch brush-cutter attachment with added 200 horsepower from the rear auxiliary engine. The machine is capable of cutting a large path of grass and shrubs along the right of way on an out-of-face program across an entire subdivision, the company said. Brandt also offers the RTB130, which is a 710 John Deere hi-rail backhoe that can be equipped with a 36-inch brush-cutter attachment. 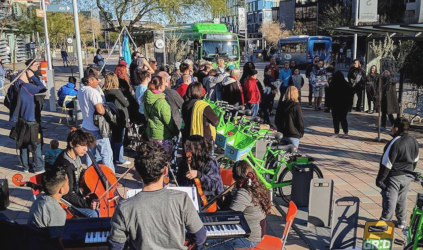 The machine has a 26-foot reach and can be used to prevent grass and small brush from blocking sightlines around public crossings and signals, company officials said. Knox Kershaw Inc.’s KBR 925 Ballast Regulator and KSF 940 Snow Fighter now can be equipped with the Diamond Mowers brush-cutter attachment, which provides versatility on the job site by quickly converting the machine into a vegetation manager. Knox Kershaw Inc.’s KBR 925 Ballast Regulator and KSF 940 Snow Fighter now can be equipped with the Diamond Mowers brush-cutter attachment. 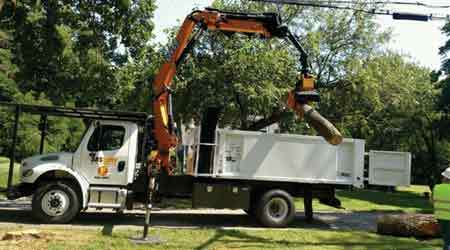 Brush cutters can be attached on both sides of the machine and operated simultaneously by two personnel in the cab. The boom reaches up to 28 feet from the centerline, and the actuator boasts 90-degree movement forward and 75-degree backward, company officials said, adding that its high load-bearing capacity includes a breakaway feature to prevent stress on the boom. Booms are constructed of high-strength steel, and boom and mower movements are controlled via main hydraulic-control circuits utilizing Sauer Danfoss PVG 32 valve banks and multi-function proportional joysticks. Additionally, a variety of mower heads are available, including 90-inch saw, 50-inch flail and 60-inch rotary styles. All heads can cut up to 8-inch diameter material and, when idle, the brush-cutter mowers rest securely on a rack mounted at the front of the machine, according to the company. Loftness Specialized Equipment Inc. manufactures a line of vegetation-management equipment, including horizontal drum mulchers, flail mowers and mechanical tree trimmers. The company’s newest offering is the Battle Ax, a horizontal drum mulcher attachment. Loftness Specialized Equipment Inc.’s newest offering is the Battle Ax, a horizontal drum mulcher attachment. Available for both skid steers and seven- to 15-ton excavators, the Battle Ax features a new rotor with depth gauges that help feed the optimal amount of material into the machine. It also creates finer particle sizes than other equipment and works with either sharpened knives or carbide cutting teeth, according to the company. Additionally, Loftness officials expect to launch a new disc mulcher for skid steers in 2018. 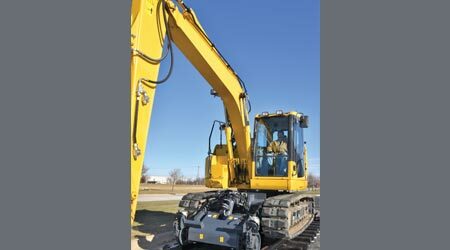 Mitchell Equipment Corp. offers three different sizes of hydraulic drive rail gear kits to fit excavators (sizes ranging from 20,000 pounds to 60,000 pounds) that can be used with a brush-cutter attachment for vegetation control. Mitchell Equipment Corp. offers three different sizes of hydraulic drive rail gear kits to fit excavators that can be used with a brush- cutter attachment for vegetation control. By using a hydraulic excavator, trees and brush can be removed with a brush cutter and the excavator can prepare the ground for re-growing vegetation that helps prevent re-growth of weeds, grass and trees, Lovitt said. “The excavator could just as easily be fitted with appropriate equipment to replant native vegetation that resists the harmful regrowth of weeds and trees,” he added. The company also offers a ballast broom that can remove the vegetation inside the track “very efficiently,” Lovitt said. 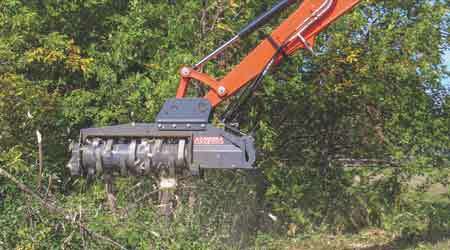 Progress Rail’s latest vegetation management product is a brush-cutting attachment for the company’s Kershaw Ballast Regulator. 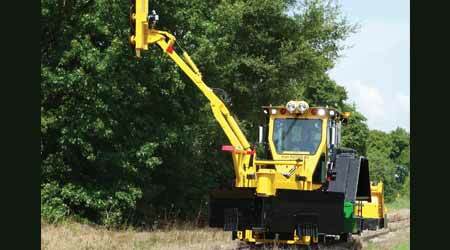 The attachment can extend 25 feet for ease of maintaining vegetation near track beds. “After field tests, one customer has purchased this new attachment and we are working with other customers to determine how this new offering may benefit their maintenance-of-way fleets,” company officials said. The company also offers the 75HRT (Hi-Rail Truck), which is designed to provide easy track access and ensure operational flexibility. And the new 75G2-HR (Hi-Rail) SkyTrim is a rough-terrain, rubber-tired vehicle with a telescoping boom and saw-type cutter head designed to trim trees on nearly any terrain. Equipped with hydraulically controlled rail wheels, the machine can be readied to propel down a rail track in a matter of minutes, the company said. 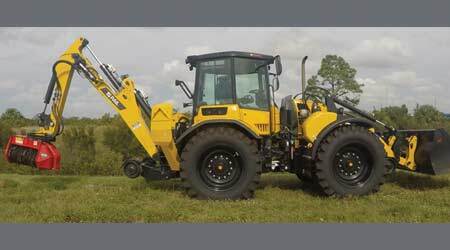 Vancer offers the Huddig 1260C Hi-Rail, a wheeled backhoe loader system featuring a specialized articulating center pivot system that enables the machine to operate multiple attachments, including brush cutters for vegetation management projects. The Huddig 1260C Hi-Rail is a wheeled backhoe loader system featuring a specialized articulating center pivot system that enables the machine to operate multiple attachments. Featuring a 157-horsepower engine, the machine operates multiple attachments for various MOW projects, including tie replacement, ballast regulation, material handling, snow management and utility work. Additionally, it features an auxiliary tool valve and hose reel to run hydraulic handheld tools, and the option to add on a man lift and/or a remote control. Vancer also offers several models of hi-rail equipment to accommodate the varying needs of railroads and rail contractors. Michael Popke is a Madison, Wisconsin-based freelance writer. Email comments or questions to prograil@tradepress.com.